Red River Paper (RRP) recently introduced their Palo Duro Smooth Rag 310 paper, 18 mil thickness, 100% cotton rag substrate, smooth matte surface and no OBAs. 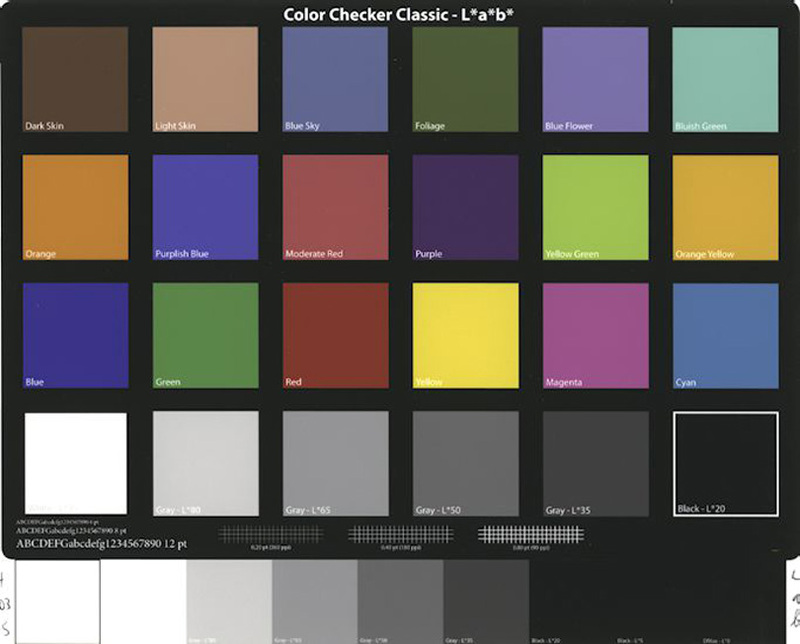 Their recommended Media Type for Epson printers is Epson UltraSmooth Fine Art Paper (USFAP) and for Canon Pro models, Heavyweight Fine Art paper. RRP provides printer profiles for this paper on their website, wherein lies an interesting exploration we’ve seen before and will revisit below. As usual, I also tested the paper by making a custom profile for it. The paper has the typical kind of smooth coating, heft and feel of others in its class. A quick perusal of rows 3 and 7 in Figure 1 immediately indicate that two very different types of profiling are at play here: RRP provides an M3 profile, while my custom profile is an M0. (Recall: M0/M1/M2/M3 refer to different “measurement conditions” in i1Profiler; M0/M1 include UV, M3 excludes it; M3 includes polarized readings.) As discussed in my review of RRP Palo Duro Etching, an M3 profile is one made with a spectrophotometer designed to use a polarizing filter (Barbieri provides this, X-Rite’s “i1” systems do not). There has been some discussion on this website’s Forum about the relative merits of the two profiling approaches (M3 versus M0/M1/M2). Boiling it down, while in principle the M3 profile can provide for more black density and gamut volume in the profile data and more differentiated shadow and highlight detail seen on prints than the other flavours (M0/M1/M2), profiling in these latter conditions may return statistical results indicating greater accuracy of colour rendition when measured with M0/M1/M2-capable spectrophotometers. These distinctions are maintained in the profiling data for this paper. 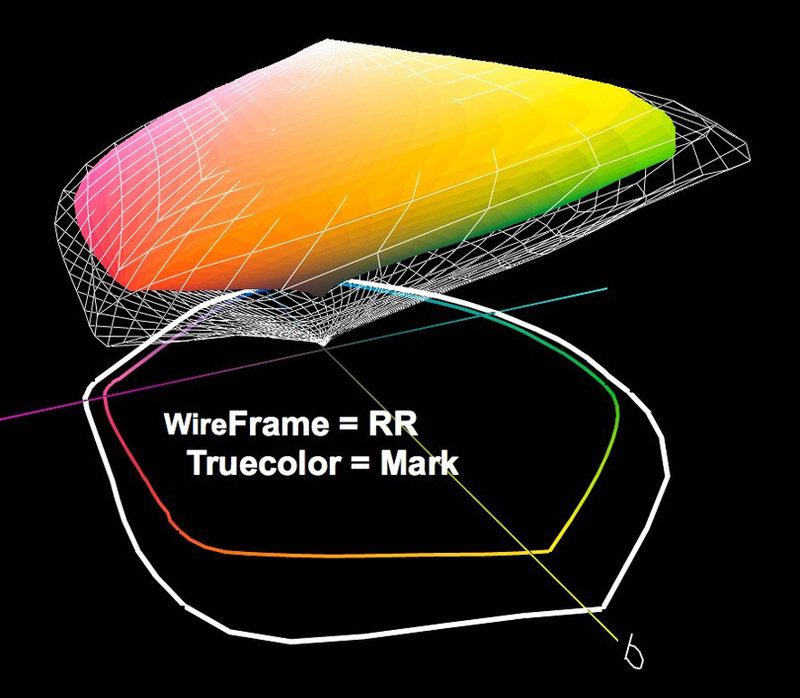 Reading the RRP M3 profile data in ColorThink Pro (CTP), the gamut volume in the M3 profile data is 872,665, while for the M0 profile it is 555,392, well within the norm for a matte paper profiled and measured using M0 measurement condition. 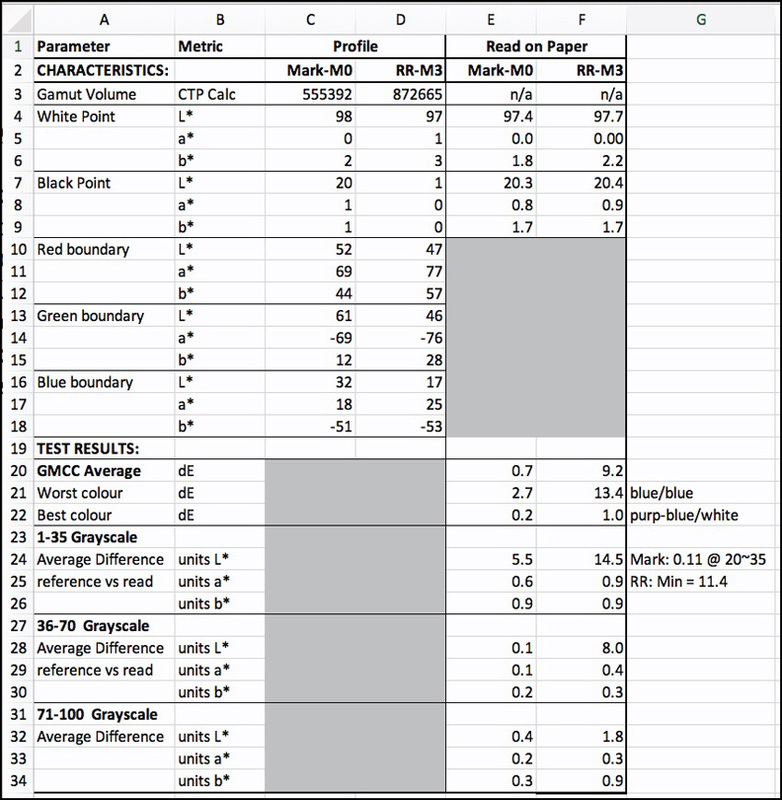 The Black point is L*1 for the M3 profile, whereas for my custom M0 profile it is L*20, again more familiar for matte papers. The difference between Black Points of L*1 and L*20, before we put ink on paper, appears as seen in Photoshop on my display (Figure 3). Based on these comparisons of the profiles’ CTP readings for Maximum Black and gamut volumes, you would expect that a print made with the M3 profile, having much higher reading of gamut volume and much denser reading of Maximum Black, would be much richer looking than a corresponding print made on the same paper with an M0 profile. That, however, is not what appeared when I made prints with Absolute Colorimetric Rendering Intent, which, for proofing purposes, attempts to reproduce on paper all image file source colours, including white, as accurately as the printer/profile combination can manage. 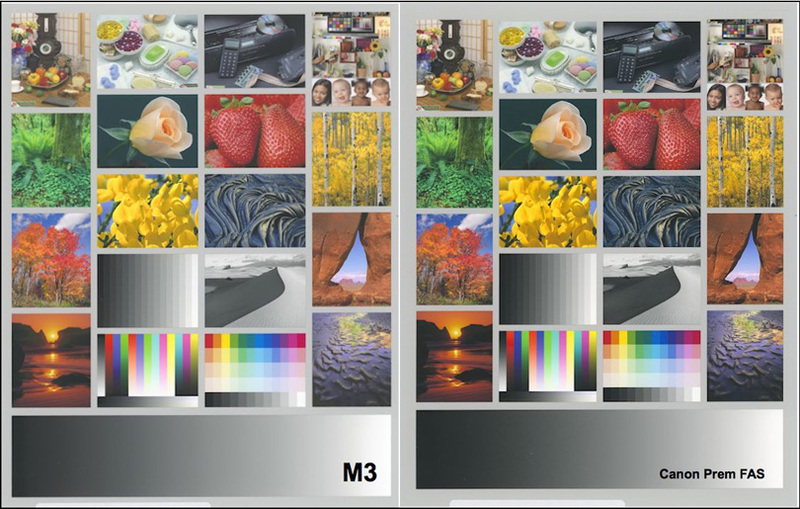 Figures 4 and 5 show the comparative outcomes when printing the same file with the M3 versus the M0 profile. in Absolute Rendering Intent. The M0 print exhibits deeper Black and more saturated colour compared with the M3 print, printing with Absolute Rendering Intent, which you would not do, unless you were conducting printing accuracy tests of the kind I am doing here. If you were printing using the M3 profile in Relative Rendering Intent, which would be normal practice, the overall appearance (Figure 6) is between the outcomes of Figures 4 and 5. Correspondingly, when we measure the patches for printed accuracy using MO measurement condition (Figure 7), the results turn out much better from the Figure 5 print (M0 profile) than they do from the Figure 4 print (M3 profile). Recall that I am measuring the M3 print with an i1Pro 2 spectrophotometer that can read only M0/M1/M2, but not M3 measurement conditions. The data in Figure 7 for the M3 result may be very different if the patches were read with an M3 equipped device, explored in the side-bar at the end. 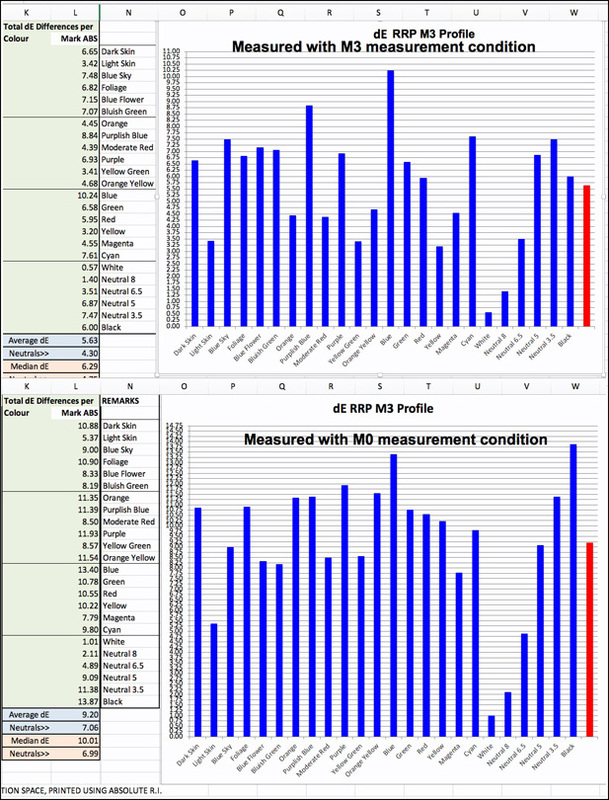 The average dE is 9.2 for the RRP M3 profile and 0.7 for my custom M0 profile, both measured with M0 Measurement condition. Regardless of the disconnect between the measurement condition for the M3 profile, just looking at the prints and a GMCC target, one can see from experience that the M0 print is closer to the file colour values than is the M3 print. The average dE from the print using the M3 profile with Relative Rendering Intent is 9.37, so just a bit worse than its sibling printed with Absolute Intent, as expected. So, given all this information, one may ask oneself why print with RRP’s M3 profile, instead of an M0 or M2 profile. Well, the answer is in differences of rendering deep shadow detail and the apparent smallness of colour differences in real photographs, statistics aside. We’ll explore this in some depth with both data and pictures. Don’t jump to conclusions yet. 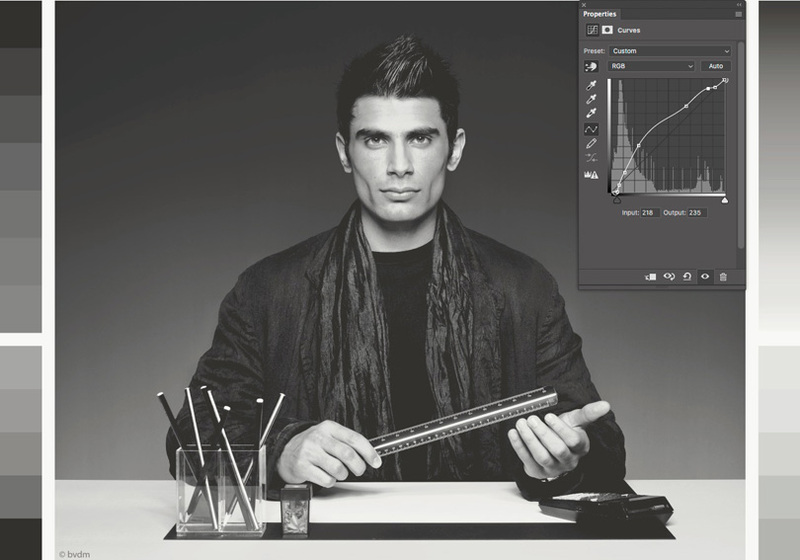 Starting with the Dark zone data, I first show the target (Figure 8) for the zone of most interest to many photographers – the shadow tones – followed by how this target prints with the M3 and M0 profiles when printed using Absolute Rendering Intent (Figure 9). The M3 profile renders levels L*1, L*2 and L*3 as L*20, and then it takes off dramatically (Red line) more or less following the target image file values in parallel but at some 15 levels above the file values (Black line). This means that if we were printing with Absolute Rendering Intent its mapping of shadow tones on paper will be considerably brighter than are the target image-file values and tonal separation will be good from target image-file value L*3 onward, because each successive level up the tone scale is about correctly separated (brighter than) the previous level. The M0 profile, however, paints a completely different picture. Every file value up to L*20 prints just about uniformly as L*20; hence there will be no tonal separation whatsoever for the darkest 20 levels, but from there onward the printed values track the target image-file values with uncanny accuracy, the Red line (printed values) being pretty much convergent with the Black line (file values). The paper supports quite accurate tonal reproduction. The smaller lower portion of the figure shows departure for each L* level from gray-tone neutrality. The red bars are for the a* channel and the blue bars for the b* channel (Lab system, one pair per L* tone level). 0 is neutral. Based on the perception comparisons I’ve made, readings up to at least 1.0 would still look gray. As the readings depart further from 1.0, a hue bias would gradually start to become apparent. As we print photographs with either Relative or Perceptual Rendering Intent, I repeated the above exercise with Relative Intent to see how these two profiles perform with this paper (Figure 10). Straight away, we can read from the Figure 10 charts that the M3 profile will provide a print with superior deep shadow tonal separation than will the M0 profile, because the Red curve is steeper (more tonal separation) for the M3 profile than it is for the M0 profile. 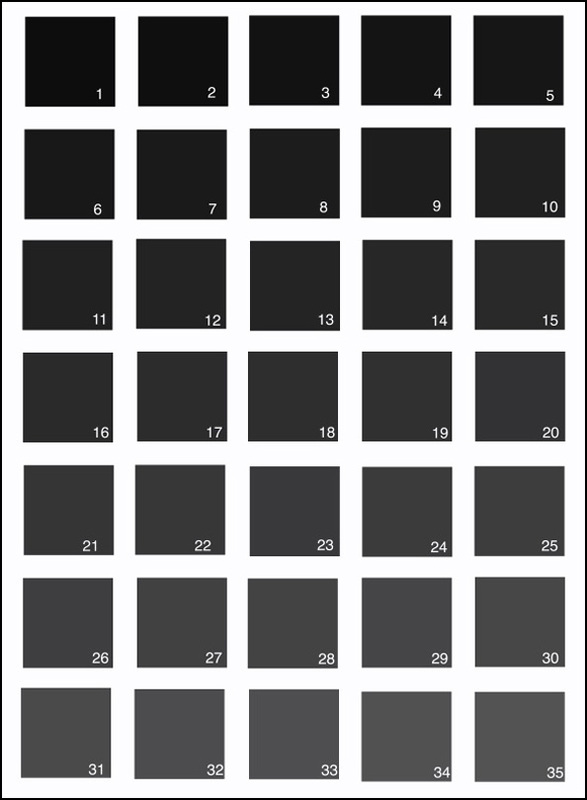 Notice in M3 that at image-file value 21 (horizontal scale), the printed value is 34 (vertical scale) whereas it started at 20, so the total printed tonal range for file values L*1 to L*21 is 14 levels. 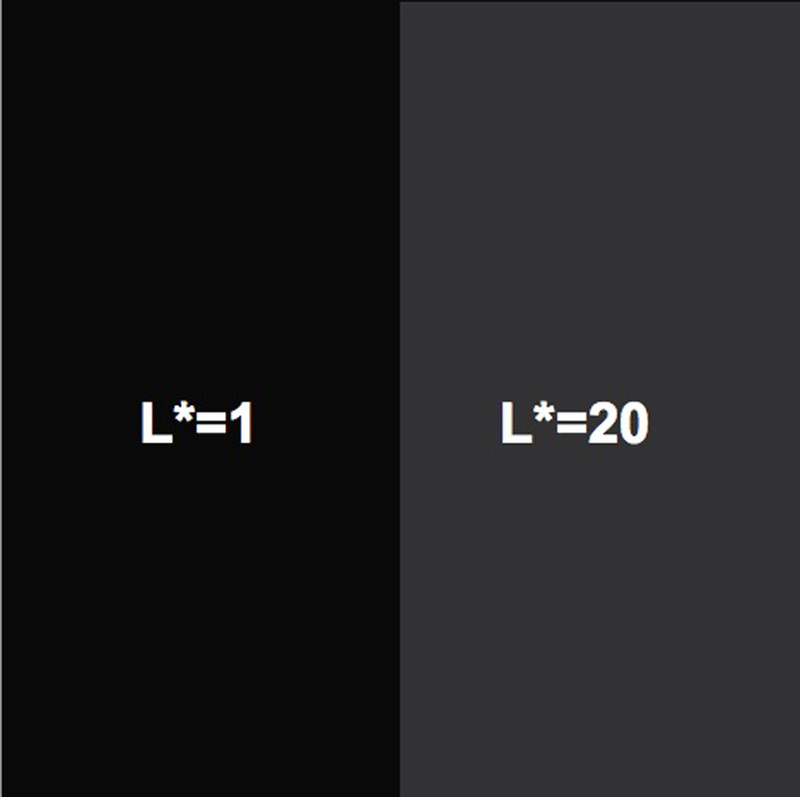 For the M0 profile, at file value L* 21, the printed value is only L*29, indicating a tonal range of only 9 printed levels from level 20; i.e. 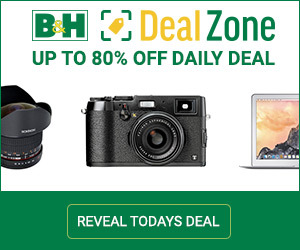 the brightest printed value within that same range is only 9 levels brighter than the darkest printed value. This difference between 14 and 9 levels means that the tonal range is flatter (you can see the curve is flatter) for the M0 profile, producing less contrast and less tonal separation in the deep shadow zone. The M0 profile fares somewhat better for neutrality of the grayscale (Figure 10, lower graphs). So much for numbers and Excel charts, let us see the various effects in a photograph testing Black tone appearance: the Roman 16 lowkey B&W test image (Figure 11). The objective here is comparative visual evaluation of tonal separation in the deep shadow zone from using either an M3 or an M0 profile for printing the photograph (Figures 12~15) with Relative Rendering Intent. This photograph was expertly designed (by BVDM of Germany) to do exactly that. Figure 15. The Curves Adjustment Resulting in Figure 14 (Screen Grab). Comparing Figures 12 and 13, very much as the graphs in Figure 10 predicted, there is more tonal separation from the M3 profile than from the M0 profile. Look particularly at the separation of the hair from the background, and the tonal separation in the jacket. Both are more distinct with the M3 profile. So, the question arises whether with post-capture edits under M0 profile softproof, one can emulate the tonal separation of the M3 profile, while printing with the M0 profile. This is what Figure 14 does, and Figure 15 shows the Curve needed to achieve it. As you can see, the adjustment is “fiddly” and not a perfect emulation of the M3 profile effect, but it does achieve the basic objective of more separated deep shadow tones. I also used the Roman 16 high key image to visualize differences in highlight zone tonal separation between the M3 and M0 profiles, and observed that if there were differences, they are largely imperceptible. 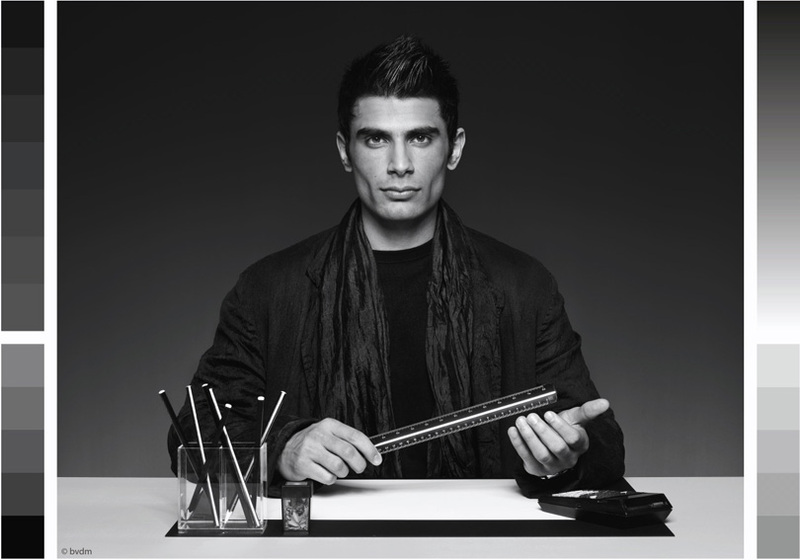 Figures 16 and 17 provide comparisons between the M3 and M0 profiles for the Mid-tones (Levels L*36-L*70) and the Highlights (Levels L*71-L*100) respectively. For the Mid-Tones, the M0 profile provides uncannily accurate tonal range reproduction of the image-file values to on this paper (near convergence of Black and Red lines, the latter read from the print). The M3 profile will print these tones lighter than the M0 profile, and with slightly less contrast between the lower and upper end of the range (the Red line lies quite a few levels above the Black line and is moderately less sloped). For the Highlights, one observes far less difference between the performance of these profiles compared with the outcomes for the Mid-tones and Dark-tones. This explains why the prints of the Roman 16 high-key image differed little between the two profiles. Hue neutrality is on the whole better for the M0 profile. Summing up the discussion of tonal rendition with this paper and the tested profiles, the RRP M3 profile is a good choice when the primary objective is better tonal separation in the deep shadow zone. For overall richness of colour, Figure 5 would indicate that richer overall colour rendition would favour the M0 profile. However, one target of 24 patches is not sufficient perceptual evidence, so I further explore this aspect of the paper and its profiling using real pictorial test images below, comparing it with Canon’s Premium Fine Art Smooth, which is possibly the best paper I’ve tested to date for Black shading appearance in this family of matte papers (rag substrate, smooth surface, bright with no OBA content). 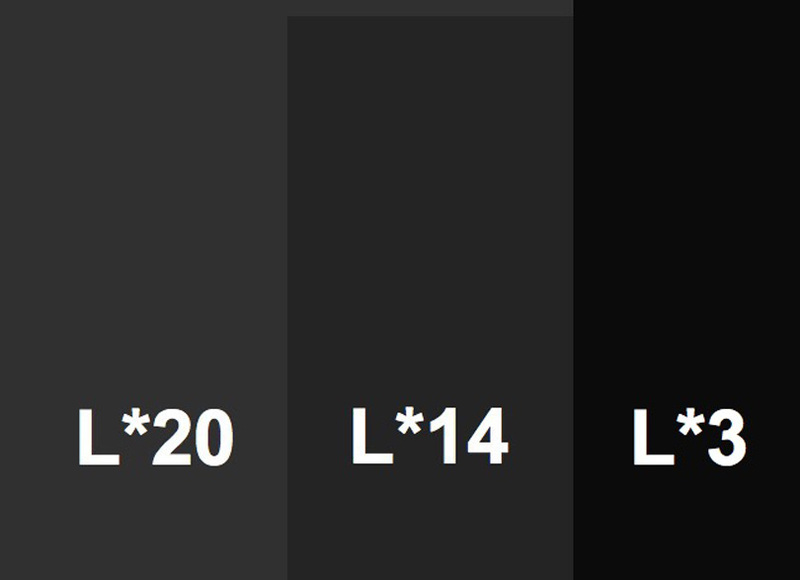 In what follows, it will be useful to first see the stand-alone difference between two shades of Matte Black – L*20 and L*14 (Figure 18), the former being the maximum Black for RRP Palo Duro Smooth Rag, and the latter being maximum Black for Canon Premium Fine Art Smooth and Hahnemuhle Photo Rag. I’ve also added a comparison for the Maximum Black (L*3) easily achievable with a good luster paper. As you may observe, seen side-by-side, the difference between the two shades of matte Black is noticeable, and this comes into play for the following illustrations. Seen side by side, the L*20 shade is deep gray, while L*14 is already starting to look more blackish, though still not as Black as achievable with a good quality luster paper (far right). 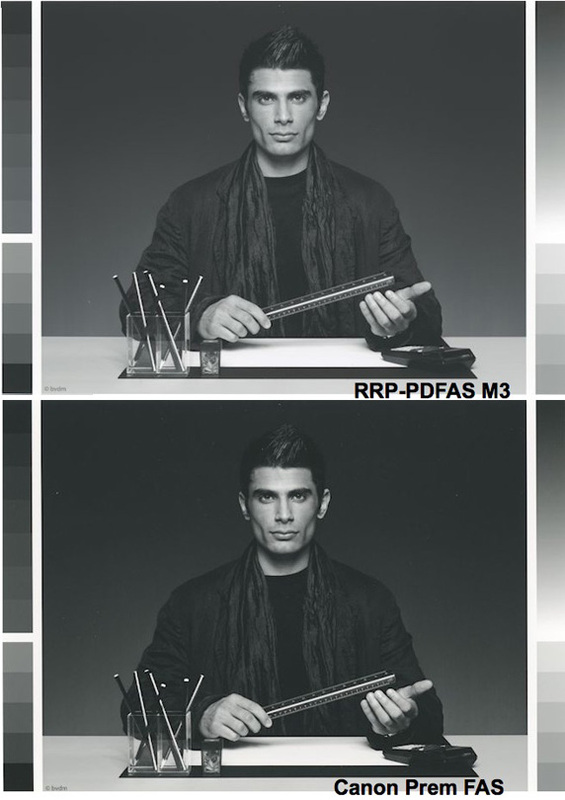 The first pictorial comparison uses the Atkinson Printer Test Image, printed with RRP’s M3 profile, and my M0 profile (Figure 19), using Relative Intent (as for all the following). The first thing you may notice is that the differences are subtle, but they do exist. You should notice that the M3 profile has a slightly lighter footprint overall, hence there is slightly more tonal separation in the very dark areas of some images; one fairly obvious example is the green petals of the leaves in the photo of the pink rose. Figure 20 below features another more concentrated example. Here again, you can see that the M3 profile provides slightly more overall clarity than the M0 profile, which has a slightly heavier footprint. 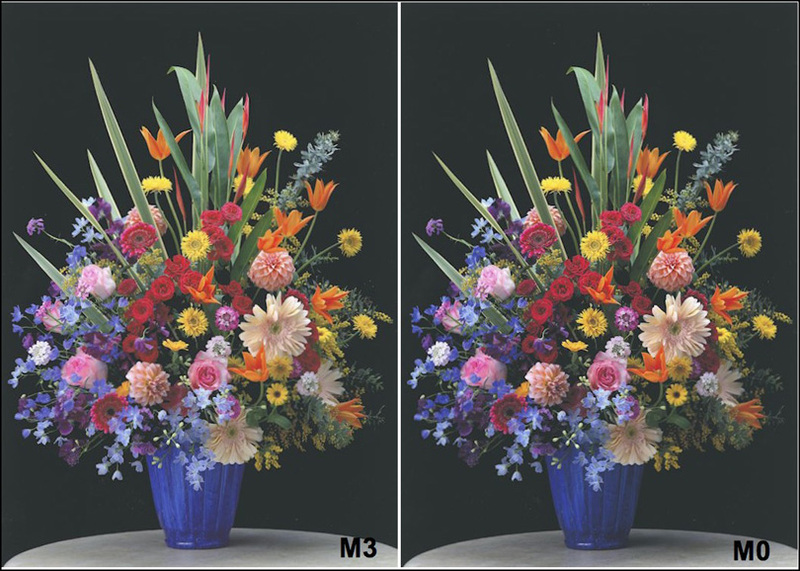 Look in particular at the lower part of both images, where the shadow detail on the vase and the lower hanging flowers is clearer in the M3 result than in the M0 result; likewise, the red roses near the center-left seem to “pop out” a bit more with the M3 than the M0 – subtle but existent. 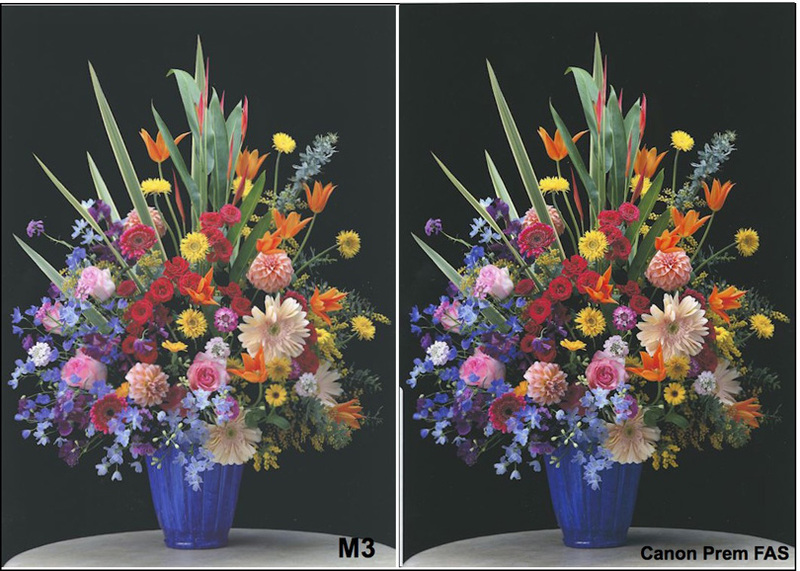 Next, I compare RRP Palo Duro Smooth with Canon’s Premium Fine Art Smooth (Figure 21, Relative Rendering Intent). The key difference between these papers in this context is that the Canon paper has about a 6 level deeper maximum Black and produces, in general, a slightly more saturated image than obtained from the Red River paper. Hence you will notice how much more saturated the strawberries are on the Canon paper than on the RR paper. Likewise, for most of the other colours. Hahnemuhle Photo Rag behaves quite similarly to Canon’s Premium Fine Art Smooth. Also, notice in the tonal ramp that the Canon paper shows slightly deeper Black and slightly grayer White than does the Red River paper. The same comparison is made for the Proprietary Test Image (Figure 22, Relative Rendering Intent). Here again, notice that the Black background is denser for the Canon paper than it is for the Red River because it has a deeper maximum Black and the image-file value for that background is L*0. 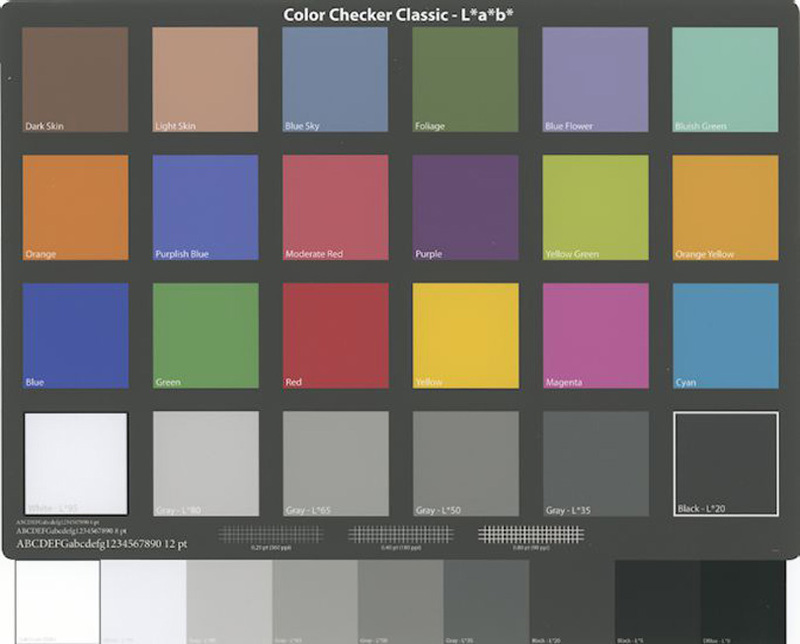 The Canon paper tends to show a slightly more saturated colour palette with a bit less clarity in the deep shade areas, most likely due to the profiling. Finally, I show the low-key Roman 16 Dark B&W photo for both papers (Figure 23, Relative Rendering Intent). The Red River paper shows a less dense Maximum Black and slightly lighter footprint compared with the Canon paper, as predicted from the difference of the two papers’ Black points (as measured in prints in M0 measurement condition). Therefore, the tonal separation in the very dark areas is more obvious for the Palo Duro Smooth paper printed with an M3 profile than it is for the Canon paper printed with an M0 profile. However, the Canon outcome is also highly satisfactory insofar as the deep shade tonal distinctions remain apparent. In the final analysis, I’m not about to say which of these two papers is “better”, because it’s mainly a matter of taste. Recall as well that none of these prints have had any editing adjustments whatsoever, so there is scope to play quite a bit with image appearance in either of them; however, one incontrovertible fact is that the Canon paper can print with a 6 level deeper Maximum Black than the Red River, and the differences this makes are visible. Indeed, I was mildly surprised to see a new matte paper of this kind with a relatively lighter Black point than we are becoming accustomed to seeing from some other recent offerings. That said, the Red River paper supports quite accurate profiling within its printable range and can produce high quality prints. 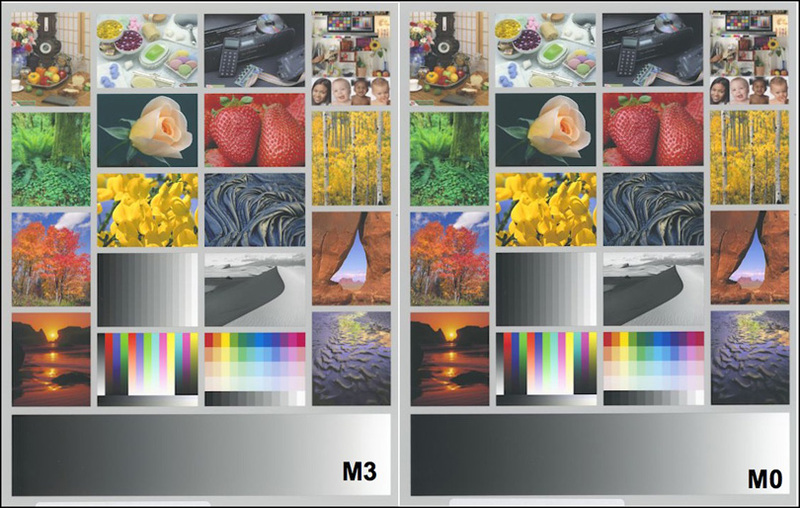 The availability of the M3 profile, along with the possibility of making custom M0/M1/M2 profiles gives the user these options to choose from, depending on what “look” is preferred for which photo. In the main body of this article, I noted the inconsistency implied by reading test targets using a different measurement condition from that used to make the profile from which the test targets are printed. Normally, it is best practice to read the results of using a profile with the same instrument used to make the profile. The difficulty is that for this case, there are few spectrophotometer models in the world equipped to handle the M3 measurement condition and those that do exist are costly (e.g. Barbieri, starting at USD 9000) – i.e. beyond my pay grade. Fortunately, Chromix, the people who make Red River’s profiles, were kind enough to run a test for me (big thank-you) using a couple of my key targets for profile testing: the GMCCTW 24-colour target, and my 35 Neutrals dark-tone grayscale target. I’m glad I requested their help with this, because the results are most interesting. I sent them these targets printed in Absolute Rendering Intent, again with the proofing context in mind. Starting with the GMCCTW 24-color target, recall from the article, the RR profile is made with M3 measurement condition, the results from which I read with an i1Pro 2 in M0 measurement condition; the resulting average dE was 9.2 (ouch). Reading the same target print with their M3-equipped spectrophotometer, the Chromix results returned a dE of 5.6 – considerably better, as to be expected (Figure SB1). The big improvement of their results over mine for their M3 profile comes from the consistency of profile creation and profile testing using the same instrument with the same measurement condition. However, neither read as accurately as the results from my M0 profile read with my i1Pro 2 spectrophotometer in M0 measurement condition (Figure 7 above). The left side of the picture deals with the M3 profile. 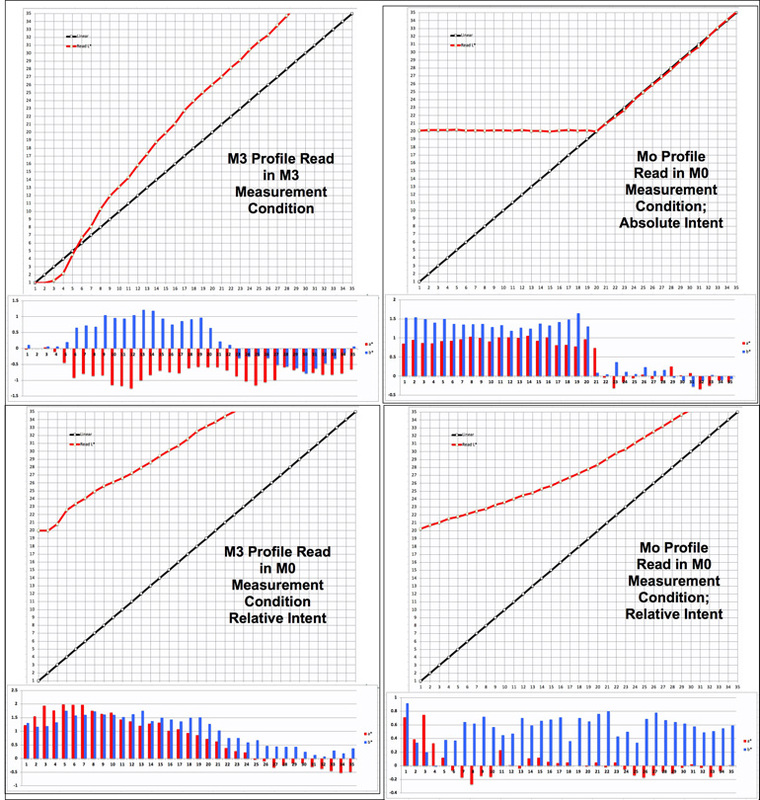 When the results of using that profile are measured with an M3-enabled spectrophotometer (upper left panel), the statistical outcomes show much deeper blacks, much more contrast and greater accuracy relative to the file values than observed for the same profile’s results measured with M0 Measurement Condition (lower left panel). So far, so good – this confirms the technical expectation. But in the final analysis, when you print with that profile, the Measurement Condition with which printer test targets are measured doesn’t matter. What counts is how the profile helps interpret the colour values in the image file, and these are the same in the same profile regardless of the measurement conditions used to analyze printer test targets. The results in the upper left graph are quite a good statistical portrayal of the outcomes expected from PK inks on gloss or luster papers. We’ve seen from the real-world photographs above that we can’t get such results from a matte paper, (unless perhaps we were to wear polarized glasses for viewing the prints made with M3 profiles); but we can get results having better dark tone separation than prints made from a custom M0 profile using Absolute or Relative Intent, as to be inferred from the right side of Figure SB2, upper and lower graphs respectively.